As crown prince, Ludwig I was already inspired by the idea of shaping a »Bavaria for all tribes.« His vision of a monument to the »German nation as a whole« led to the construction of the Befreiungshalle (Hall of Liberation) on Michelsberg in Kelheim, southwest of Regensburg. The festive inauguration took place on October 18, 1863, the 50th anniversary of the Battle of the Nations near Leipzig. 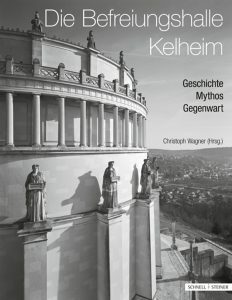 Appearing to mark the 150th jubilee of the Befreiungshalle is a publication that vividly showcases the myth, history, and current importance of this national monument. This volume, prepared under the direction of Prof. Dr. Christoph Wagner, invites readers to rediscover this shrine of national pride. New, comprehensive photographic documentation is presented alongside numerous scholarly texts that provide access to a hitherto unknown collection of historico-cultural source materials.